Alex Smith has been waiting for this moment since becoming the number one pick in the 2005 draft. 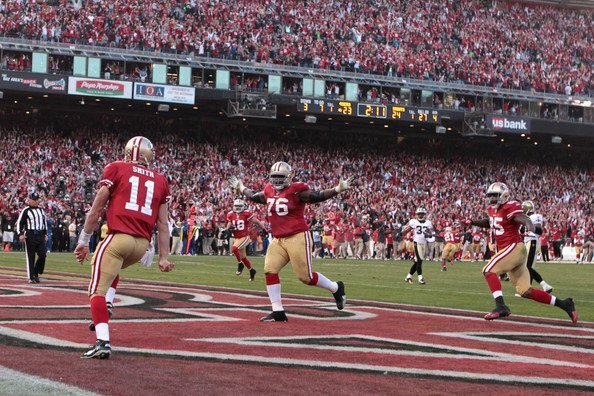 From the future franchise quarterback to one who didn’t get to play a snap in 2008 and almost getting cut to the first quarterback to win a game for the 49ers in the postseason, leading them over the Saints to a 36-32 win. Alex Smith is not a better quarterback than Drew Brees, but with a great defense behind him, he was more confident this year than in all the previous six seasons combined. The most important thing about Smith this season was not trying to do what he can’t, everything leading up to his dominant winning drive, or drives in the fourth quarter. Drew Brees and the New Orleans Saints lost the game in the first quarter. It seemed impossible to comeback after turning the ball over four times in the fourth quarter. Still, with 1:37 left in the fourth quarter, Jimmy Graham’s touchdown put the Saints in the lead, about to win their first ever playoff game. Less than a minute earlier the 49ers grabbed the lead with Alex Smith running for the touchdown. The fourth quarter saw four lead changes. The 49ers were up 17-0 early in the second before Sean Payton and the Saints finally grabbed a hold of themselves and started actually keeping the ball. Shaky hands, great tackling and a fantastic ability to read Brees’ throwing made it look like the 49ers are about to run all over the Saints. Drew Brees and Darren Sproles, Drew Brees and Colston, Drew Brees and Jimmy Graham. Too much Drew Brees. The third quarter was the Alex Smith of old and too much conservative play calling. The Saints are a risk taking defense, very aggressive, knowing that Brees is able to come back from everything. But like on the first night of the season, the Saints fought back but fell on their defense’s inability to stop the big plays. The 49ers weren’t supposed to win with a shootout, but the cushion the first quarter gave them enabled Smith to pull his fourth quarter heroics. And suddenly, all the promise and potential came booming out in a magical fourth quarter that will go down in history if the 49ers go all the way. Suddenly, there’s no more talk about how the 49ers defense saves them. This defense can create points, but Alex Smith showed everybody he can create them, going up against the best of ’em, and win.